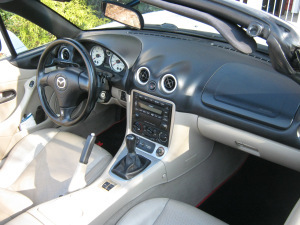 After a few years of wanting to sit in the cabin of another convertible Roadster, I happily settled on the super popular Mazda Miata MX-5. Decades ago, I owned a Triumph Spitfire, a classic British Roadster. A few sports cars and a few boring cars later, I decided it was time for another fling with a classic convertible Roadster as my daily driver. The MX-5 fit the bill perfectly. Affordable, reliable, fun, and that classic British Roadster look. Mazda built the British Roadster the Brits wish they had built. 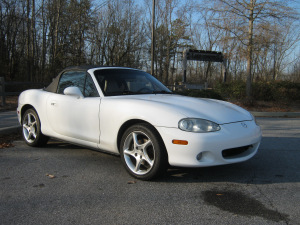 Our MX-5 is the second generation NB series, built between 1999 and 2005. She sports a 1.8 liter engine mated to a 5 speed, short throw, manual transmission. Her power to weight ratio is superb, with mid-range torque that quickly brings her up to highway speeds in fourth gear at 4500 RPM. 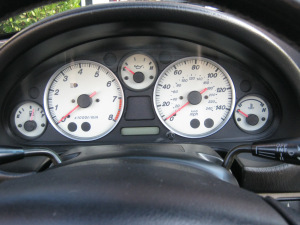 The “fun” power band sits between 4000 and 5500 RPM, redline at 7000. On the road she is a blast to drive. This car is “tight”, as a true sports car should be. No luxury, pseudo sports car here. The suspension is sport stiff, giving the driver much wanted feedback from the road. The steering is quick and responsive, just what you want on those curvy, mountain roads. Surprisingly, though, this car is very comfortable. The suspension is stiff, but not jarring. As small as this car is, once seated in the cabin, she seems to morph into a larger vehicle. Leg room is generous, as is the cabin headroom. 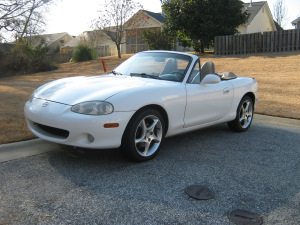 She came to us in nearly turn key condition with only 75,000 miles on the odo. Roo and I are both very happy with her, and we are looking forward to many top down adventures in the years to come. Keep the Drive Alive!